Dalmatian Pelicans at Lake Kerkini, Greece. 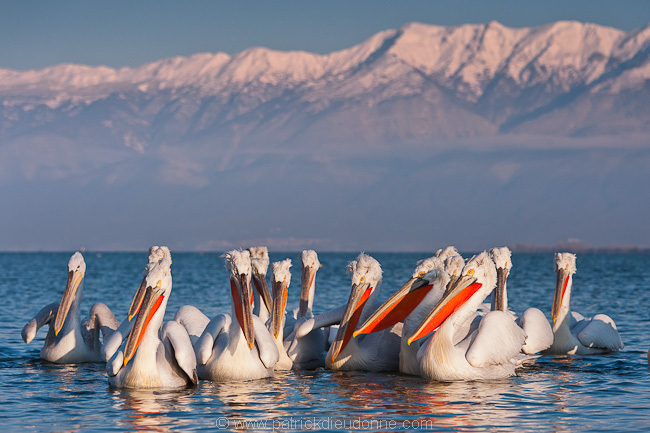 Lake Kerkini is famous among birders and photographers for its Pelicans, Dalmatian and White, and his setting of snow-capped mountains in winter (Mount Kerkini in the background). In recent years several images taken in this place won awards in the famous photo contest Wildlife Photographer of the Year (Jari Peltomäki (Endangered Species), Bence Mate). Vultures in winter in the Rhodopes, Bulgaria.